As of this writing, there are 579 customer comments and 200 answered questions for the RM43 Total Vegetation Control. I've read the customer feedback and then condensed the results into this review. I hope that this review helps you when shopping for a weed killer. The RM43 Total Vegetation Control is ideal for fence rows, gravel paths, sidewalks, driveways, parking areas, and around farm buildings and barns. All you have to do is spray it on the weeds once, and the weeds won't grow back for 1 year. The concentrated formula of glyphosate and imazapyr is effective against most noxious weeds, grasses, vines, brush, and trees. This weed killer can be used on non-crop areas as a spot treatment for brush, vines, and weeds or on bare ground for total vegetation control. Be careful that you do not spray this product over the root systems of desirable plants. This weed killer comes in 2.5 gallons, which treats up to 43,243 square feet. There were some customers that felt a higher concentration of this product was better than to use as the directions say. However you mix it, make sure to wear protective gear including something over your mouth and noise so that the poison does not get in or on your body. A customer shared the following, "I am a licensed pesticide/herbicide application specialist. I think I know what I am doing. When I spray, I mix 7.5 gallons of RM43 in a 300 gallon tank of water. That makes a 3.2% solution of spray (43% of 7.5 gallons is 3.2%. inert stuff doesn't count.) To test this solution, I have sprayed over 15 acres of RV storage area. In 3 weeks, the weeds were gone. I have not seen any new weeds in 8 weeks. I have also sprayed with regular Round UP around the same time, and new weeds are starting to pop up in that area. As far as I can see, this product works when used in the 3% amount, and keeps new weeds from coming up. Mind that most people use 1% or higher, which requires a lot of time to kill the weeds, if it even does. My customers want quick results, and at 3% I get it. I also add about 2 lbs of Sulphate of Ammonia, (nitrogen), to each 300 Gallon tank. This changes the PH of the water slightly so the Glyphosate works better. Be sure to wear protective clothing as stated on the label. For large areas, as in my 300 gallon sprays, I also wear breathing protection." Take care to not use this around any plant that you'd like to stay alive. 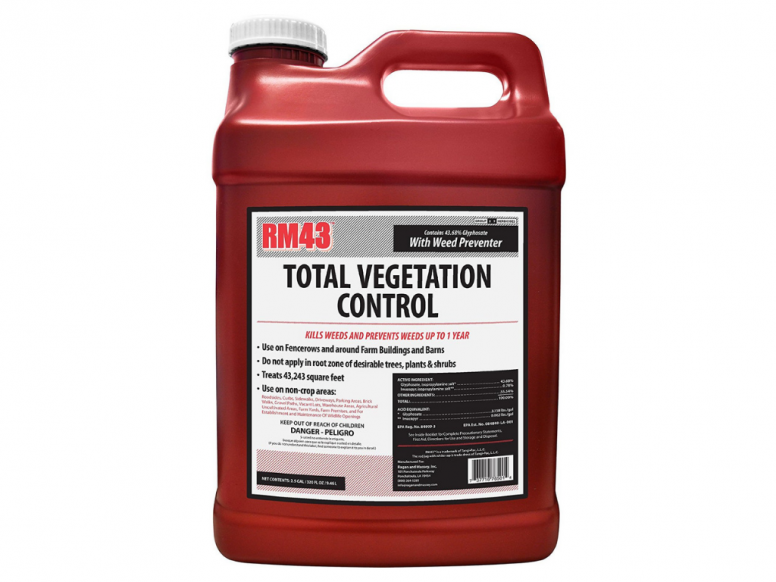 The RM43 Total Vegetation Control will kill all plants that it comes in contact with. A customer shared, "This is good stuff - it's killing African rue; a near impossibility and about 1/2 the price of a similar weed killer we can get at Home Depot. Will buy again and recommend this product if you've got a hard-to-kill weed problem. Be aware, tho, it's a strong chemical and not friendly to any plant so you don't want to be using it around something you want to keep." For the amount that you will be getting, this product is priced lower than a lot of the competitor products. A customer had this to say, "I have a large area of gravel to try to keep weed free. If you have this same situation this is a very good product to use. MUCH cheaper for the large jobs than the other total vegetation killers that you can buy at Lowes and does just as well. I tested it side by side with another more expensive brand and both did great jobs, but the other one cost $16 and did 1000 sf. While this was like $50 for the gallon it does 17,000 sf+. So for big jobs Billy Bob say check it out!" The cap and foil seal seems to be a problem as there were a lot of complaints of people saying that the bottle arrived with the chemical spilled all over. The problem seems to be coming from the cap area. Thankfully, it is also packaged in a heavy bag, so most of the poison was caught in the bag, though this wasn't the case for all customers. Some said that the packaged arrived soaked and leaking. This also made it not returnable since it would be a safety hazard to the mail carriers. Keep in mind that this is a poison that should not have any contact with the skin. This is a serious issue that had numerous complaints. A customer had this to say on the subject of the faulty containers, "I give this product 4 stars. It is not because of the product. I give it 5 stars. The packaging was my only complaint. When I opened my latest shipment (I’ve bought before) much of the product had leaked out and was in the heavy plastic bag that surrounded the jug. Luckily the plastic bag was well sealed. I could find no evidence that the box had any chemical on it, so I think everything was captured. After unpackaging it, I was able to pour from the bag into my sprayer. Upon removing the cap I could tell that the foil seal was leaking." In addition to the harm that this product can cause to the environment, use caution around pets and people. A customer shared this, "Used this product and weeds came back within weeks!! These herbicides not only do not work but we've recently learned, the hard way, they can cause Lymphoma Cancer. Do not use this if any pet or child will ever be in the area. Even after it has dried or whatever they say is a safe time period. I took it to the hazardous waste dump. It is a very hazardous poison. Get outside and just pull your weeds. It's good exercise!" The RM43 Total Vegetation Control is a concentrated formula of glyphosate and imazapyr. It is effective against killing most noxious weeds, grasses, vines, brush, and trees. It can be used as a spot treatment for brush, vines, and weeds or on bare ground for total vegetation control. Be careful that you do not spray this product over the root systems of desirable plants. This weed killer comes in 2.5 gallons and will treat up to 43,243 square feet. The price of this product is lower than a lot of the competition, especially considering the amount you will be getting. Use extreme caution around pets and people. This is a hazardous product that can cause a host of health problems. A common complaint was that this product arrived with the contents spilled out. Apparently, the problem is in the cap and foil area that is not sealed properly. It is shipped in a plastic bag and then also boxed. Some people found that the leaked contents arrived in the bag, while others said it also seeped out of the bag and out of the box. Here are some top questions that I found for people considering buying the RM43 Total Vegetation Control. Is it safe to spray around your garden? Although it will effectively get rid of garden weeds, this weed killer will also kill your vegetables. Therefore, this weed killer is not recommended to use around a garden. You would need to wait one year before you replant your vegetable plants. How will this effect larger trees? I have a property line with large trees that are being taken over by honeysuckle and poison ivy. Although some customers said it will not kill trees, it is recommended not to spray this weed killer on any plants you want to keep. The label on this product clearly says that you should not use this product around trees or any other plants you want to keep. Even if your trees are large, there is a good chance that the weed killer will kill them. It is best not to apply it near or on trees. Can I use this weed killer to get rid of lawn weeds in my yard? Yes, you can use this weed killer to get rid of lawn weeds. That said, it will kill your grass and you will have to wait a year before you can reseed it. This product is not good for spot weeding your lawn. It should only be used in areas that you don't mind the grass dying.